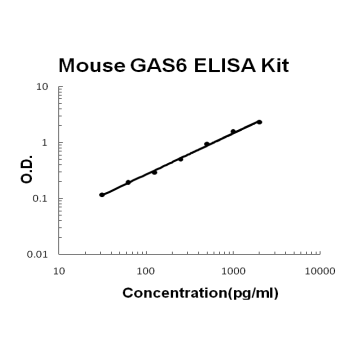 Sandwich High Sensitivity ELISA kit for Quantitative Detection of Mouse GAS6. 96wells/kit, with removable strips. Ligand for tyrosine-protein kinase receptors AXL, TYRO3 and MER whose signaling is implicated in cell growth and survival, cell adhesion and cell migration. GAS6/AXL signaling plays a role in various processes such as endothelial cell survival during acidification by preventing apoptosis, optimal cytokine signaling during human natural killer cell development, hepatic regeneration, gonadotropin-releasing hormone neuron survival and migration, platelet activation, or regulation of thrombotic responses. .
GAS6(Growth arrest-specific 6), also known as AXLLG or AXSF, is a human gene coding for the Gas6 protein. It is mapped to 13q34. GAS6 was originally found as a gene upregulated by growth arrested fibroblasts. This gene product is a gamma-carboxyglutamic acid(Gla)-containing protein which thought to be involved in the stimulation of cell proliferation, and may play a role in thrombosis. What's more, the product of the GAS6 gene, a ligand for the AXL, MER, and TYRO3 tyrosine kinase receptors, is a vitamin K-dependent protein, structurally related to anticoagulant protein S but lacking its anticoagulant activity. This protein also shows great importance in the cardiovascular system.